When I was young, my Dad used to say: “There’s no such word as can’t“. This inevitably would be his response when I moaned and said; “I can’t do it!” Dad’s response was frustrating, because he simply would not accept my version of what I thought I could not do. And so I would go away and try again–or find another way. Once I cheekily tried to counter Dad’s view by explaining ‘can’t’ was simply a contraction of the words ‘can not’. Dad was not amused and he stood firm with his view. Today I see it as a beautiful gift that he gave to my sisters and me because as a result we are all ‘can-do’ people, believing firmly that there are many ways to achieve something, even when early attempts fail. And so today’s tip is to give you ideas of how to get around the stuff you think you can’t do. Is it fear that’s holding you back? When you say to someone (or to yourself) that you ‘can’t’ do something: is it a true statement? Or is it really a fear that’s holding you back? It’s not cool to admit that you are afraid of something and so we have become incredibly adept at ways of not facing our fears, even when it stops us from doing the things we would really love to do. Think for a moment of things you feel you can’t do: like a get new job/promotion, or find a new love, save money, live within a budget, move house, lose weight, stop smoking, or… what exactly is it for you? Notice how easily it is to give yourself a rational reason for NOT doing any of the above. Like, we’re in a recession: jobs aren’t easy to come by. Ditto for the reasons why you can’t move house. Or I’m addicted to nicotine. Or I’ve never been very good at managing money, etc, etc. Your rationale definitely has a point—but it’s just one point: it’s not the entire picture. Just now jobs are not two a penny: the house market is sluggish: nicotine is addictive: breaking old habits is not always easy and so on. But is it true that NO-ONE gets a new job, or moves, or loses weight, or stops smoking? No. But the fear of making these changes can stop you even trying. Making these changes often means changing who you are. Becoming this new person is often at the core of such a fear. An excellent way to begin banishing your fear is to write about it. For example, your thought processes might look like this: “If I am promoted that means I need to manage more responsibility. I’m scared I’m not good enough: that I might fail” After writing about your fears, counter it with: “How will I feel if I don’t go for this promotion? What is the worst that can happen if I get the promotion?” You will be amazed how powerful this exercise can be as it gets you look at the real issue, not mask you are using. Do you (perhaps subconsciously) blame others? When you say I can’t do something, do you add a ‘because’? For example: “I can’t be promoted, because my boss is so mean and unsupportive?” Or, “I can’t do it because I don’t have (money/qualifications/time) to do it”. Or, “I can’t lose weight: (because) I’ve tried every diet”. These statements don’t always appear to be blaming (like the last example), but they are. This common narrative is really saying that it’s the boss’s/lack of money/diet’s fault, not yours. As soon as you take this stance, you are stuck. So, if you discover that you are blaming others for your “I can’t…” then it is time to step into your own responsibility and choose to see that no matter how much others might not be aiding you, it’s your choice to let them stand in your way, or find a solution that CAN work for you. See one of my old Tips, No More Blaming, for more on this. Wayne Dyer expressed this beautifully as: “All blame is a waste of time. No matter how much fault you find with another, regardless of how much you blame him, it will not change you”. Most people have come across the phrase ‘positive thinking’ understanding that thinking positively can help you move forward in life—and this is true! What most people are unaware of is how damaging negative thinking is. If you are constantly saying, “I can’t do this”, then your subconscious accepts this as fact. It does sobecause the subconscious mind does not work rationally, analytically or chronologically, rather it is influenced by what I call ‘weight of evidence’ and then acts accordingly. 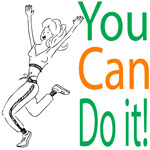 So if your self talk contains lots of: “I can do…” this adds weight to your subconscious processing. If however your self talk is repeatedly, “I can’t do…” then likewise your subconscious will be influenced in a negative way. If waved my magic wand over you and suddenly all of your “I can’t do it “ dissolved away and you found you COULD do all that you wanted, what would that FEEL like? Visualizing and feeling the positive outcome of your desire is another great way of getting your subconscious to help you. Again because the subconscious works primarily with imagery, symbolism and connections that are not bogged down with the rational reasons, this can add to the weight of evidence your subconscious needs to help create the stepping stones to your goal. Creating a Vision Board is a fun way to remind yourself of what you wish to create in your life. To do this, take a large sheet of thin card. Then cut out photos from magazines or print images from your computer of people, situations, or material objects you aspire to be like, to do, or to have. Create a collage of the images. Add positive words to your image. Now take your artwork—vision board—and place it somewhere you will see it everyday: for example beside your bathroom mirror, or inside your wardrobe door, or on your fridge. Every time you look it, the more comfortable your subconscious become with the idea that this is something you can do/be or have and the possibilities of how to make this happen begin to open up for you. To see how I used this and other techniques, please see how I made my dream come true in buying The Jasmine House. When facing an “I can’t do it” scenario, it’s often because want you want to do (be or have) feels insurmountable because, in your eyes, it’s so large. So, what CAN you do? When I first had my dream of owning The Jasmine Centre (now House), I wasn’t even living in the area, nor did I believe I had enough money to buy such a place, but the dream was very strong, so I knew I had to take a step towards it. And so in 2005, I bought the domain name, thejasminecentre.com—4 years before I bought the house. When I moved down to Weymouth in 2006, I drove around the surrounding villages looking at places where The Jasmine House might be located. When I saw the house for the first time, in 2007, I stuck the property details on my fridge door, for even though I still believed I could not afford it, I trusted that my subconscious would eventually show me a way—and it did, with the generous help of my 4 business angels, Jeannette, Hilary, Denise and Helen. And no, the methods I’m suggesting don’t always work—at least not in the way I thought they would! However, they do enough times for me to continue to use and benefit from them in my own life. I believe that when your heart, soul and mind are fully aligned it always works. And if nothing happens when I tried all of the above, then just as when I was younger and faced my Dad’s “There’s no such word as can’t”, I go away and find another solution, or a different way and trust that ultimately the Universe knows better than I do in terms of what is right for me and when. I hope you too will be inspired to do the same.